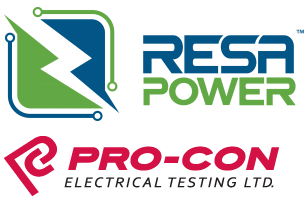 Houston, TX, March 22, 2017 – RESA Power, LLC, a market leader in life extension solutions for power distribution equipment, has secured its first service offering in Canada with the acquisition of Pro-Con Electrical Testing, Ltd.
Based in Richmond, BC, Pro-Con Electrical Testing has been providing electrical testing and maintenance services for electrical power system assets in British Columbia for over 21 years. “The acquisition of Pro-Con is significant because it represents RESA’s first expansion into the Canadian market and reinforces our growing reputation as a leader in the supply of services to the North American electrical power market. We have opened several new service locations throughout the USA in the last 18-months and I’m confident that we will replicate that success in the Canadian market through our partnership with Pro-Con’s experienced team”, says Brian McSharry, President and CEO of RESA Power. Craig Lawson, owner and CEO of Pro-Con Electrical Testing said, “I am very pleased to become a part of the RESA Power team. By joining RESA and Pro-Con’s products and services, customers will benefit from the combined resources including RESA’s DYMAX service division and membership in NETA (International Electrical Testing Association). RESA was a natural choice of partner given their strategic vision and hunger for growth. RESA Power is the market leader in life extension solutions for power distribution equipment. RESA is comprised of business units across the United States specializing in various niche power distribution & circuit protection markets such as obsolete & hard-to-find inventory, fast turnaround on current model equipment, engineering services and testing & maintenance. RESA has several primary distribution facilities and service centers across the U.S., accommodating one of the largest inventory of power distribution and control equipment in North America. RESA employs field sales engineers serving every major US metropolitan area through our network of business units. For more information about how to join the RESA Power group, visit https://www.resapower.com. This entry was posted in News and tagged acquisition.